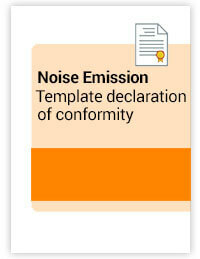 This template contains the content of the Declaration of Conformity (DoC) for Noise Emission by Outdoor Equipment according to Directive 2000/14/EC. The template contains the content of the Declaration of Conformity (DoC) for Noise Emission by Outdoor Equipment according to Directive 2000/14/EC. For equipment that also needs to comply with other directives, these should all be indicated on the Declaration. For questions, please contact us at info@instrktiv.com.